Kingdom Hearts χ[chi] 2nd Anniversary! Which Anniversary Artwork do you like better? It has been two years since Kingdom Hearts χ[chi] has been launched. On the 2nd Anniversary, Donald, Goofy, Chip and Dale once again crashed their gummi ship onto Daybreak Town. This time they came with a letter from Mickey asking them to search for the "key". What new revelations will there be at the end of this event? Stay tuned to 6th August to find out! 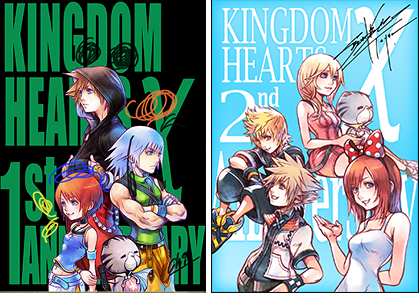 While waiting, let's just admire the artwork Tetsuya Nomura has drawn for this anniversary. A shooting star is shown crashing into Daybreak Town. It turns out to be the Gummi Ship. Chip: Geez! It's all your fault for moving the ship while it's still in preparation! Goofy: Is there anything we can help with? Chip: Don't touch it! We'll start repairing the gummi ship so go somewhere else to past time. Donald: Okay, we'll look around this area then. Goofy: We'll leave the gummi ship to your hands. Donald and Goofy start out to explore the surroundings. Donald: The "key" right? Okay, let's go look for it! Donald and Goofy got blown away during a battle and land on top of Moogle. Heartless suddenly appears. Moogle ran forward to fight it but the tip of it's handmade Keyblade broke off, and the rest came with it. Player rushes in to help. 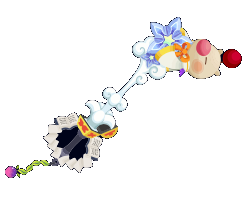 The keychain lying on the ground automatically goes to his Keyblade, transforming it into the Moogle of Glory. He goes on to defeat the Heartless. Goofy: In any case, it seems that this is the real "key". Donald: Is this kid really the "key" the King told us? Moggle: Moogle's treasured weapon has been absorbed by the loyal customer, kupo! Don't worry, the kind Moogle will not ask for it back right away, kupo. I want you to use that weapon to hit many enemies to make it stronger, kupo. You can return it after that, kupo. As usual, I'll lend my assistance by trading items with you at my store, kupo. Well then I'll see you later, kupo! Goofy: Alright, we can use this chance to observe this child to see if he really is the "key". Goofy: We have time anyway. Goofy: We'll lend you a hand if there is anything we can do. Moogle: This is a bit different from Moogle's plan but it's okay, kupo! This way, Moogle can obtain a strong weapon without doing anything dangerous, kupo. 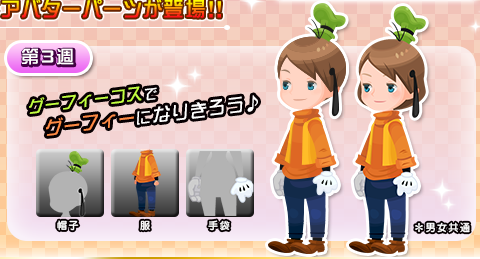 Donald and Goofy came over to Player, who has just defeated a Heartless. Donald: See? Told you I saw something in him. Goofy: Huh, did you said that? Donald: This kid is definitely the "key"! Moogle rushes to the Player. Moogle: The weapon looks strong enough, kupo. Time to return it to Moogle as promised, kupo. Donald: Aww, not when we just found the "key"! Player hands the Moogle Keyblade to Moogle, but it went back to him immediately after. Moogle: Why did it go back, kupo? Return it to Moogle, kupo! Moogle snatches the Keyblade, but it made its way back to the Player again. Goofy: Looks like it's impossible to remove the "key" from this child. Goofy: All that's left is to find the King. Chip and Dale rushes in. Chip: Hey, we've been calling for a while why aren't you noticing? Dale: We were very loud. Chip: No time to explain, hurry up! Chip and Dale dashes away, with Donald and Goofy right behind them. Player follows the group. Back at Seaside Park, Chip and Dale gets into the Gummi Ship immediately. Dale: Since the ship is in preparation before this, the engine is unstable! It may take off anytime! Donald and Goofy got in quickly. Goofy: Ah-hyuck, looks like we got on just in time. Donald: What about the "key"!? Donald and Goofy looks at the Player who is outside. Player waves goodbye smiling. The Gummi Ship takes off into the sky. Chirithy: In a big hurry just as usual. Rewards will be distributed to users who are in the top 10 in the below categories. *Postcard and stickers will be delivered to your home address. If there are any players here for managed to win, prepare a proxy service for this. *Results will be announced on 23rd July. From 16th July till 6th August, there will be special treasure chests across the maps. It will cost 10 AP to open the regular ones, and 40 AP to open the rare ones. Inside will contain various kind of rewards. Once opened, the chests will need 12 hours to respawn. Refer here for the locations. When you logged in from 16th July till 6th August, these will be rewarded: 2 SR+ Sora, Riku & King Mickey (Power), 10 Ethers, 10 Potions, 5 Raise Tickets, 2 Adamantites. Till 23rd July, participating in this survey will earn you 300 Charge Munny, 10 Potions and 10 Ethers. These will be distributed on 30th July. Refer to this thread for the survey instructions. - From 16th July till 6th August, you can earn Gold Mog Points by defeating the event Heartless while equipping the Keyblade "Moogle of Glory". This Keyblade has already been distributed to the Present Box. - To upgrade this Keyblade, you need to use the points in the Event Trade Shop to purchase the special upgrading materials. - The Event Trade Shop will be available till 13th August. Refer to this post for the contents. - During this event, there are various Subjugation and Trial missions for you to earn limited avatar parts and cards. - During these 3 weeks there will also be ranking rewards based on the total amount of Gold Mog Points you have earned each week. Refer here for the rewards list. Note 1: Event Materials are needed to level up this Keyblade. They are Kupo Seed, Kupo Leaf, Kupo Flower and Kupo Drop. Kupo Drop will only be available from 30th July. Note 2: These event materials are obtainable from the Event Trade Shop, and are also dropped by the event Heartless. Note 3: These event materials will not be available after this event. Note 4: Moogle of Glory is a permanent Keyblade and will still be available for use after this event. Gold Mog Boosters can be used from the Plaza and Field Map screen. Once you click the button, a 10 minute timer will activate immediately. During this 10 minutes, all Gold Mog Points from defeated event Heartless are doubled. This boost is stackable with the Cross Disaster abilities. This boost will still be in effect even if you enter a battle with 1 second remaining, as long as you win it without any continues. Gold Mog Boosters are only obtainable from the daily log-in rewards and Charge Shop. Every 2 unused boosters by the end of this event will be compensated with a Mega Potion. If you have an odd number of boosters, 1 will be forfeited. Note that unlike previous booster events, you can use up to 5 boosters at one time. Giving you a full x10 boost for 10 minutes. While a Gold Mog Booster is in effect, talking to either Donald, Goofy, Chip or Dale will give you a 60 AP recovery. - Chip & Dale can be found in Seaside Park. - Donald can be found in Fountain Plaza, District 2, and Bridge to Outskirts. - Goofy can be found in District 1, Central Marketplace, Seaside Promenade, and Clock Tower Outskirts. *In-game rewards will be distributed on 6th August. *In-game rewards will be distributed on 30th July. Date for postcards will be announced later. *In-game rewards will be distributed on 23rd July. Date for postcards will be announced later. AND YOUNG KAIRI AND NAMINE! OMG ALL THE CARDS! FF-- I JUST SAW THE ANNIVERSARY CARD! I LOVE THE OUTFIT SWITCHES. And thank you for setting up everything already! Whats with that keyblade when fighting darkside? Edit: I'm dumb Gave it to use for free . So much stuff to do. I missed the First anniversary, hopefully I can make it up on this one. Can someone help me find out the HP for all 4 event Heartless? Could you help clarify on how to use those gold mog points or whatever they are? More so after that seasalt trio will be permanently on my deck. I believe the freebies they give you are used to boost the rate you get the Mog Points, and those are used in the Event Trade store. Pretty standard. 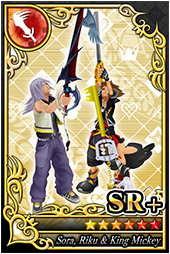 not the thin one, the one that's right next to picture of Sora, Riku and Roxas that advertises the new cards. 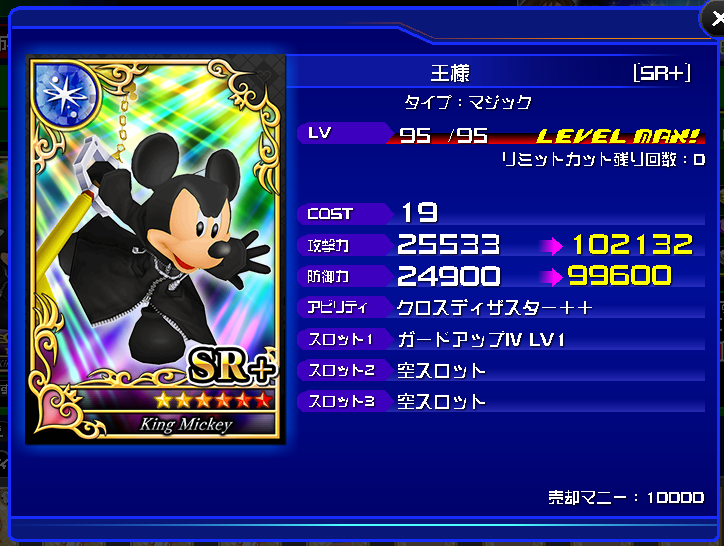 wait can you get that roxas card with just raise tickets? ...35 tickets later or so.. It's until Japanese midnight, limited offer thing, so like another 5 hours until it's over. I got so many ultimate moogle cards yet I have no clue what they even do.. Pulled this with only 1 ticket. Even better, I'm a Three Wishes user.